With more than 20 years of nursing experience, Ms. Hayes is highly recognized and regarded in her field. In 2004, she joined the National Alliance of Legal Nurse Consultants after becoming a certified legal nurse consultant through the Vickie Milazzo Institute. Ms. Hayes previously became a critical care registered nurse at The University of Tennessee in 1996 and earned an RN at Roane State Community College in 1994. She was a U.S. Collegiate Winner in Nursing at the United States Achievement Academy in 1994, and she was on the National Dean’s List from 1993 to 1994. Ms. Hayes was also a nominee for the Norma J. Shepherd Award for Excellence in Critical Care Nursing while at The University of Tennessee in 1996. She opened Hayes & Associates in 2002, after working as a critical care nurse for many years. Her current responsibilities include reviewing cases and records, completing timelines, establishing chronology, offering opinions, overseeing work and forwarding work back to law firms. 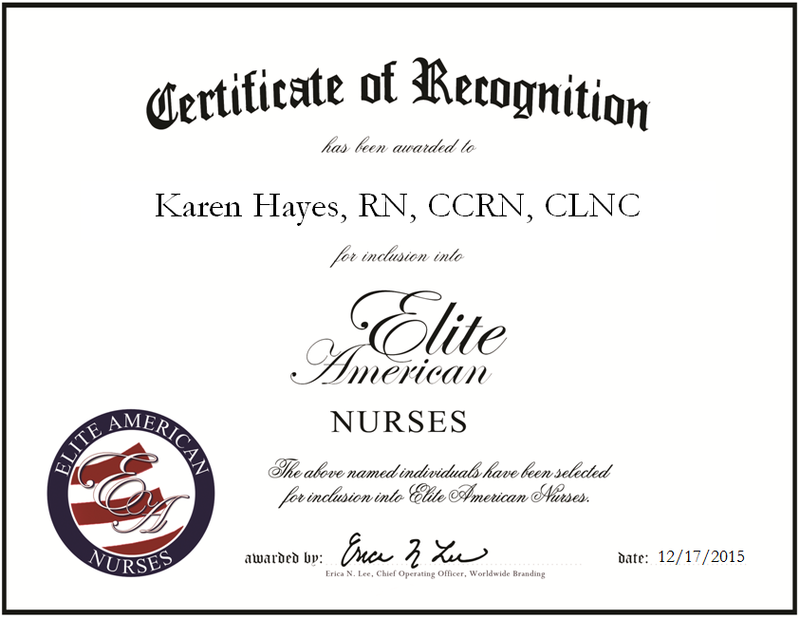 Ms. Hayes is currently affiliated with the American Association of Legal Nurse Consultants, and attributes her success to the referrals she receives and the word-of-mouth marketing of attorneys. In the next five years, Ms. Hayes hopes to continue growing her business and bring other nurses on board. This entry was posted in Consulting and tagged American Association of Legal Nurse Consultants, certified legal nurse consultant, critical care registered nurse, National Alliance of Legal Nurse Consultants, registered nurse, Vickie Milazzo Institute. Bookmark the permalink.